Discussing this topic, the author wishes to clarify that the discussion will be limited to the period after World War II. There are not enough research materials yet before the war and in that earlier period Southern Mindanao was not yet that economically important to the country since the great wave of migration to the region only happened starting in the 1950’s and then peaking in the 1960’s and the 1970’s. Talking of Southern Mindanao ports, these consisted mainly of Davao, General Santos (or Dadiangas) and Cotabato (which is actually Parang or Polloc port located in another town) and to some extent also Pagadian and Kabasalan in earlier times and also Mati and Bislig. Since ships generally used the western approach, inadvertently Zamboanga port will be included in this since all ships to Southern Mindanao port using the western approach will use that as an intermediate stop since it just lies along the route and it has a good passenger and cargo volume. After World War II, shipping to Southern Mindanao boomed because it was the “new frontier” of the country. There was great migration by Christians from other parts of the country and this was encouraged and supported by the government to ease the “land pressure” in Luzon and Visayas which was the fuel then for the land unrest (read: Pambansang Kilusan ng Magbubukid, Sakdalista movement, Hukbalahap, etc.). The land of Mindanao was being opened through the building of roads and the bounty of the land and the forests were being exploited (without asking the say-so of the native peoples and that fueled the unrest of the latter decades; the Luzon land unrest was “solved” to be replaced by Mindanao unrest and war – what an irony and tragedy!). And so people and goods needed to be transported and in such a situation where “ships come where there is cargo” there was a battle for the Southern Mindanao ports among the local shipping companies. Davao was the primary route and port of Southern Mindanao and almost invariably the Davao ships will also drop anchor in Dadiangas (General Santos City). At the outset, it was Compania Maritima which led the pack to Southern Mindanao after World War II as she was the biggest liner shipping company then with the most ships, half of which were big by local standards (that means a length of about 100 meters). The company possessed ex-“C1-M-AV1” surplus ships as compensation by the US Government for their ships lost during the war and also big cargo-passenger ships from Europe while the competition had no better than the small ex-“FS” ships from the US Army which have to seek shelter when the seas begin to roil. Among the Compania Maritima competitors to the Southern Mindanao ports in the late 1940’s and early 1950’s were Philippine Steam and Navigation Company (PSNC), Manila Steamship Company, De la Rama Steamship, William Lines Inc. and Escano Lines. Most of the liner shipping companies of the day then shirked from Southern Mindanao routes because it was taxing on the fleet as the ships needed two weeks for the entire voyage. So just to be able to offer a weekly schedule, two ships of the fleet must be devoted to a Southern Mindanao route. It was Philippine Steam and Navigation Company (PSNC), being backed by Everett Steamship of the United States, which was more competitive against Compania Maritima as it also had ex-“C1-M-AV1” and ex-“Type N3” ships. PSNC was a venture between Everett Steamship and Aboitiz Shipping (and later with the end of “Parity Rights”, it passed on to the latter). Manila Steamship Co. was competitive, too since it also had a big fleet. However, this company quit shipping after the explosion and fire that hit their flagship “Mayon” in 1955. Meanwhile, De la Rama Steamship even quit earlier to concentrate on international shipping and being an agents after some local issues. The year that Manila Steamship quit shipping, the new liner company Carlos A. Go Thong & Company joined the Southern Mindanao battle, too. In the mid-1950’s, with some shake-out in the shipping industry, there were less competitors and ships in this decade (because some really old ships have already quit along with some very small ones). It should be noted, however, that there were ocean-going liners that were originating from Southern Mindanao that goes to Manila first before proceeding to Japan and the USA. Some of those that provided that kind of service were Everett Steamship and Compania Maritima. In the 1960’s, passenger-cargo ships from Europe that were bigger than the ex-“FS” ships began to arrive in the Philippines and many of these were fielded to the Southern Mindanao routes. Among the users of that type were Go Thong and William Lines. Go Thong was also able to acquire the big World War II surplus “C1-A” ships like the “Manila Bay” and “Subic Bay”. Compania Maritima, however, bought brand-new liners and chartered big reparations cargo-passenger ships from the government-owned National Development Corporation (NDC) and so they held on to their lead in the Southern Mindanao routes in this decade. Meanwhile, Everett/PSNC was not far behind and they even used in Southern Mindanao their new liners from Japan, the “Elcano” and the “Legazpi”. Additionally, there was a new entrant in the late 1960’s, the ambitious Sweet Lines which was one of the beneficiaries of the quitting of General Shipping Company of local routes (the other was Aboitiz Shipping Corporation). At the start of the 1970’s, Compania Maritima was still ruling the Southern Mindanao routes. But several very interesting developments happened in this decade. First, the big Go Thong/Universal Shipping which already exceeded Compania Maritima in size had broken into three shipping companies and Sulpicio Lines Incorporated, Carlos A. Gothong Lines Incorporated and Lorenzo Shipping Corporation emerged (until 1979 the operation of the latter two were joint). In a few years time, however, Sulpicio Lines grew fast and proved to be a strong competitor. In this decade, it was already slowly becoming obvious that Compania Maritima was losing steam especially as they regularly lost ships in storms. William Lines then was in a race with Sulpicio Lines to dislodge Compania Maritima from its perch. Everett Steamship meanwhile bowed out because of the end of “Parity Rights” of the Americans (and thus they are no longer allowed to do business as a Philippine “national”) and PSNC (their partnership with the Aboitizes) was merged with Aboitiz Shipping Corporation and the latter became the surviving entity. But with no new ships, Aboitiz Shipping Corporation bowed out of Southern Mindanao liner service. However, the combined Lorenzo Shipping Corporation and Carlos A. Gothong Shipping Lines (CAGLI) and Sweet Lines Inc. were still competing heavily in the Southern Mindanao routes in the 1970’s. Two very important developments happened before the end of the 1970’s. One, containerization began and this changed the game of shipping. Where before it was just practically the liners that carried the cargo, now the carriers split into two, the container ships and the liners. Subsequently, the passenger capacity of the liners grew as they no longer have to devote a lot of space for cargo. By this time, the massive migration of Christians to Southern Mindanao has also boomed its population and consequently more need to travel. The second development was the introduction of fast cruiser liners that call on just one intermediate port (before a liner to Davao will usually call first in Cebu, Tagbilaran, a northern Mindanao port maybe, Zamboanga definitely and Dadiangas. So where before 10-knot ships like the ex-”FS” and ex-”C1-M-AV1” ships will take two weeks to complete an entire voyage and the faster ex-European passenger-cargo ships cycles every 10 or 11 days, the new fast cruisers complete the voyage in just a week. By my definition, fast cruisers of this period were the liners capable then of 18 knots. Usually, these were not converted cargo-passenger ships from other countries (these were fast cruisers even in Japan, usually). These were also luxury liners in the local parlance and one key feature of that is the availability of air-conditioning. With that truly luxurious suites and cabins became possible. 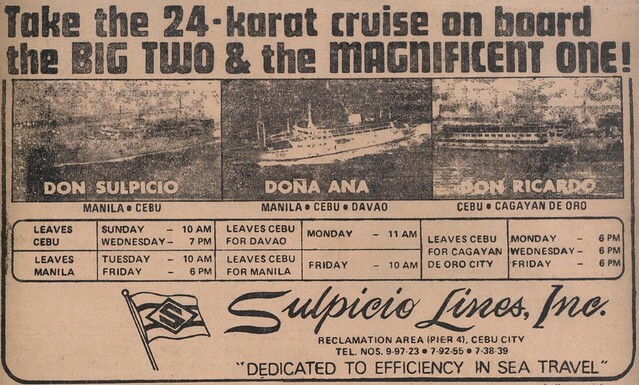 The fast “Dona Ana” (later “Dona Marilyn”) of Sulpicio Lines which came in 1976 tried to change the game by just having one intermediate port call, in Cebu. William Lines responded with the even faster cruiser “Manila City” (the second) in 1976 which only had Zamboanga as its intermediate port. With their speed and the use of just one intermediate port, the “Dona Ana” and “Manila City” was able maintain a weekly schedule. Although the luxurious flagship “Filipinas” of Compania Maritima was also fast at 17 knots, she dropped by many intermediate ports and so she cannot maintain a weekly sailing. Compania Maritima never dropped the old style of many intermediate ports. Gothong+Lorenzo was not able to respond well to this challenge (though they tried) as they had no true fast cruiser liners. So, they had to use two ships for a route to maintain a weekly sailing or three ships to maintain a cycle of every 10 days. Sweet Lines also tried but like Gothong+Lorenzo they also have no fast cruisers assigned to Southern Mindanao (they had two though in Cebu, the “Sweet Faith” and the “Sweet Home”). Compania Maritima and Sweet Lines were the users of three ships to the Davao route to be able to cycle a ship every 10 days. Aboitiz Shipping, meanwhile, with no new ships simply dropped out of liner shipping to Southern Mindanao and just concentrated on container shipping. Although William Lines and Sulpicio Lines already had fast cruiser liners to Southern Mindanao they also still used their old passenger-cargo ships to the region in the late 1970’s in conjunction with their fast cruisers liners. So with them the passengers have a choice of the fast or the slow which was also less luxurious. Fares also differed, of course. In passenger liners, William Lines and Sulpicio Lines continued to battle in the Southern Mindanao ports in the 1980’s using fast cruiser liners. Sulpicio Lines had the edge as they had more fast cruiser liners [William Lines still had to make do with their graying former European passenger-cargo ships]. For a while until they quit in 1984, Compania Maritima was battling Sulpicio Lines more than toe-to-toe. After all, Southern Mindanao was the area of concentration of Compania Maritima and in Davao they even have their own port, the MINTERBRO port. Compania Maritima concentrated their best liners, the “Filipinas”, “Visayas” and “Mindanao” plus their passenger-cargo ships “Leyte Gulf” and “Dadiangas” in the General Santos/Davao route before the company’s life expired. While the three were battling, the other liner companies were not able to respond except for Sea Transport Co. and Solid Shipping Lines which were not operating passenger liners. One independent liner company, the Northern Lines Inc. which had routes to Southern Mindanao also quit at about the same time of Compania Maritima at the height of the political and financial crisis leading to the mid-1980’s. Before the era of RORO liners, there were already more container ships to Southern Mindanao than passenger liners. That how strong was the growth of that new paradigm. This new dominant paradigm even forced the fast cruisers to carry container vans atop their cargo holds as that was already the demand of the shippers and traders. In the 1980’s before the advent of RORO liners starting in 1983 there were actually only a few fast cruiser liners doing the Southern Mindanao routes. Among those was the “Dona Ana”, the pioneer fast cruiser of Sulpicio Lines to Davao. This ship was later pulled out to replace “Don Sulpicio” in the Manila-Cebu route as the ship caught fire and she was renamed to “Dona Marilyn”. However, the fast cruisers “Don Enrique” (the later “Davao Princess” and “Iloilo Princess” and “Don Eusebio” (the later “Dipolog Princess”) alternated in the Manila-Cebu-Davao route. In 1981, when the “Philippine Princess” came, “Dona Marilyn” was reassigned to the Cotabato route. She was the first fast cruiser liner in that route. On another noteworthy trivia and clarification, Sulpicio Lines also fielded the third “Don Carlos” in the General Santos route in 1977. This ferry was a former vehicle carrier in Japan and so she had a cargo deck and a ramp. However, she was not used as a RORO ship. The ramps were just used to ease the loading of livestock from Gensan. This city sends a lot of those live commodities to Manila. She was actually a “WOWO” ship (Walk on, Walk Off). However, she also takes in heavy equipment and trucks bound for Gensan dealers. So technically “Don Carlos” was the first RORO to Southern Mindanao. But she did not use container vans. For William Lines, the second “Manila City” (the first “Manila City” was an ex-”FS” ship) was their only fast cruiser to Southern Mindanao for a long time in this decade. Most of the passenger ships they were using in the region were former European passenger-cargo ships like what Sweet Lines were using (the company was also using the “Sweet Grace” to Southern Mindanao which was a brand-new liner in 1968 but was not that fast). Approaching the end of the decade only three national shipping companies were left sailing liners to Southern Mindanao – Sulpicio Lines, William Lines and Sweet Lines. One of the reasons for that was the crisis spawned by the Aquino assassination halved the number of liner companies in the Philippines. It was not because the traffic to Southern Mindanao dropped considerably. In container shipping to Southern Mindanao before the RORO liners came there were six players – Aboitiz Shipping Corporation, William Lines, Sulpicio Lines, Lorenzo Shipping Corporation, Sea Transport Company and Solid Shipping Lines. In 1983, a new paradigm arrived in the Southern Mindanao routes and it ushered a new era. These are the RORO (or ROPAX) liners which were even bigger and just as fast as the fast cruiser liners. And they can carry more container vans than the fast cruisers. Later, RORO liners were even faster as they can already sail at 20 knots. Can anyone hazard a guess which was the first RORO liner of Southern Mindanao? I will discuss the era of RORO liners in Southern Mindanao in a subsequent article (as I do not want this article to be too long and unwieldy). With that, it will be a discussion of the recent history of the Southern Mindanao routes and liners. PSSS Discussions Proceed here for PSSS discussions. Currently hosted on the PSSS Flickr page.